Did anyone tell these chicks not to climb out of the pot plant? It seems to me that the chicks got wind of the friendly wager PPO chatters have taken on what date the chicks will brave standing on the lip of the pot. This 'staying put' suits me because the date I chose is the 3rd November, which is in a couple of days time. Whoever told the chicks not to move, please remind them that Thursday is the time to start really exploring. 'Go on chicks, the 3rd is an excellent date to begin exploring'. 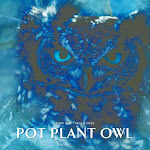 Pot Plant Owl is allowing herself more time away from her chicks. The past few mornings, viewers on the webcam have seen two cute chicks in the pot plant - often without PPO. Some of the time, she dozes in the far pot plant or stands on the balcony railing. An hour later, we check on the chicks and find that PPO has disappeared. She's not on the balcony, or anywhere in sight. She'll leave the chicks completely alone for an hour or two, and then suddenly reappears. It is fascinating to watch her, because I don't believe her actions are purely based on getting her own free time. From my observation of PPO over four years now, I can believe that PPO has an agenda - probably to teach the chicks to be on their own, or 'grow up' a bit. Don't you wish your parents did that when you were growing up? On a sad note, I was told yesterday about owls that were killed at a school in Johannesburg. The act was deliberate and probably based on superstitions about owls. I have been asked to do a talk at that particular school to see if we can get through to at least some children. To end on a happier note, there is a lovely article in the 'Birdwatching Magazine' in the UK about PPO - entitled "Potty Owls Gain Global Support." Thank you to everyone who has contributed to the 'global support' for these owls. We really appreciate each and every one of you! Hi! Have tried to find the article that you are talking about, and can't! Would love to read it. Can you please give more info so I can find it? Thanks for sharing the wonderful little ones and PPO and Pappa with us! They are all precious! Um Potty Owls? Typical OK humor, LOL! Well, I do love UK humor - most of the time! So sorry about the owls at the school. Hope you can change their superstitious beliefs. Hmmm 2 more days and you win! Love reading the blog and watching the owls. Just one small, pedantic, comment. Should it not be that PPO is sitting in the plant pot rather than in the pot plant? I'm actually very hurted about the owls killed at the school. Tracy, you're doing so great for owls there! I'd like to help. Maybe to ask all my FB friends, also the ones who don't care any birds, to put "I like" on your site could help a little. I'm thinking that if those wonderful animals would be.. trendy, we could get slowly through those horrific superstitions, the same affecting so many countries (a lot in Italy :/). Since the web's power is strong and numbers have to be counted, give us, please, your advice, it's welcome! Love to follow the chicks, just like to think they hopefully are going to life, not to a deliberate death.